Springer is retracting 107 papers from one journal after discovering they had been accepted with fake peer reviews. Yes, 107. To submit a fake review, someone (often the author of a paper) either makes up an outside expert to review the paper, or suggests a real researcher — and in both cases, provides a fake email address that comes back to someone who will invariably give the paper a glowing review. In this case, Springer, the publisher of Tumor Biology through 2016, told us that an investigation produced “clear evidence” the reviews were submitted under the names of real researchers with faked emails. Some of the authors may have used a third-party editing service, which may have supplied the reviews. The journal is now published by SAGE. The retractions follow another sweep by the publisher last year, when Tumor Biology retracted 25 papers for compromised review and other issues, mostly authored by researchers based in Iran. With the latest bunch of retractions, the journal has now retracted the most papers of any other journal indexed by Clarivate Analytics’ Web of Science, formerly part of Thomson Reuters. In 2015, its impact factor — 2.9 — ranked it 104th out of 213 oncology journals. After the retractions as a result of fake peer review (amongst others) in 2015 and 2016 that involved Tumor Biology, the decision was made to screen new papers before they are released to production. Based on this extra screening, new names of fake reviewers were detected and in order to clean up our scientific records, we will now start retracting these affected articles. The current retractions are not a new case of integrity breach but are the result of a deeper manual investigation which became necessary after our previous retractions from Tumor Biology in 2016. The extent of the current retractions was not obvious from the earlier investigations in 2015. We are retracting these published papers because the peer-review process required for publication in our journals had been deliberately compromised by fabricated peer reviewer reports. Springer reviews on a regular basis all relationships with its business partners. The contract with the International Society of Oncology and BioMarkers [which owns the journal] has been discontinued and not renewed. At the end of 2016, Springer stopped publishing Tumor Biology. Springer reviews on a regular basis all relationships with its business partners. Springer was not in a position to renew the contract…We thought that a switch to a new publisher would offer the journal the opportunity for a fresh start. She added that the new publisher, SAGE, was aware of the retractions when it took over the journal in January. As a result of a very big screening we may have identified a small number of articles from various journals. Since these are ongoing investigations we cannot give further details at this point. The journal is edited by Torgny Stigbrand, professor emeritus at Umea University in Sweden, who assumed the role in 1999, when the journal was published by Karger. 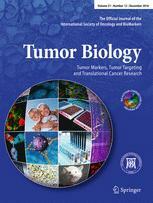 The ISOBM (society owner of Tumor Biology) approached SAGE in early 2016 seeking to relaunch their publication as an open access journal with a new publisher. SAGE entered into a contract with Tumor Biology in December 2016 and began publication of the journal in January 2017. SAGE was informed of the latest Springer investigation into Tumor Biology in November 2016, and were made aware of the scale of these retractions in late February 2017 by Springer. The society were open about the past instances of peer review fraud, and as part of the relaunch they wanted to address the underlying reasons. SAGE entered into a contract with the society in December 2016 with an agreement that the editorial board would be re-structured and there would be a complete overhaul of the peer review processes of the journal to bring it in line with SAGE practices. SAGE continues to develop a strong programme of journals representing the leading researchers, practitioners and societies in medicine. Tumor Biology provides an important outlet for experimental and clinical cancer research. SAGE works with all of our authors and editors to continually review our policies and regularly share detailed guidance on best practice in line with COPE guidelines, including implementing strict policies on the use of suggested or recommended reviewers and the use and supply of institutional email addresses. As part of their transition to a new publisher, the Tumor Biology editorial team have already introduced new robust peer review practices expected from all SAGE journals. Open peer review reports should be examined by independent researchers. I always hate it when journals ask me to suggest reviewers (fortunately, in my area, most do not). I never know whether I should suggest a big name who likely does not have time for my paper or a person who just happened to say nice things about it at a conference presentation. If this discourages journals from the practice, I will be happy. The big opening for fraud is asking authors for contact info for reviewers, and the fix is obvious and simple: journals should use the web and find that info themselves. I don’t know of any university that doesn’t post a directory. I hope somebody will look into the possible link to an editing company – and, crucially, whether the authors were aware of what the company was doing or offering to do. That would need a careful institutional investigation but if the authors were duped they should be allowed to re-submit their work. In defence of journals, it is hard sometimes to find reviewers. Of course there are rules to follow (not a collaborator, etc. ), but the system is open to abuse. As @whistleblower states, if peer review was open, then not a problem. Please please please no forcing people to sign reviews! I do my very best to review carefully, open-mindedly, and honestly, but I would simply stop reviewing if I had to sign everything I had to say. There are silverbacks in my field who send out iffy papers, have fragile egos and distorted ideas about their own infallibility, and are likely to review my grants. And no, they’re not nearly mature enough to take criticism. I am a sitting editor for Scientific Reports. One thing I do when assigning reviewers is I try to avoid using the reviewers recommended by the authors, instead I do a pubmed and a google search to find potential reviewers. In rare cases when the expert in the field IS listed in the cover letter, I would check if the authors had collaborated with the potential reviewers. I think journals should stop asking authors to recommend potential reviewers and let the editors decide whom to contact. Thank you! I appreciate your integrity and hard work! Same here. Very much appreciated. I wish it could be the norm. Asking to suggest the potential reviewers is really a bad idea. (1) If the editorial assistant is a postgraduate in the subject concerned, he/she can find 7-10 experts in the particular field of the paper to be reviewed by searching in the publications within the last 10 years and send the paper to these 7-10 reviewers. Once they get the review report from any 3 of these reviewers, they can take the decision based on that. Please Don’t appoint the first author of any paper as reviewer, even if it is from the highest impact journal, because most of the first authors are PhD students. (2) This way each journal can build up a data base of the reviewers who do good reviewers and share this database among the journals/publishers. (3) Blacklist all the authors who publish in bogus journals and reject the paper submission by such authors without any review. This should be mandatory. Once researchers are aware of this, they will stop publishing in such journals and we can slowly reduce such journals. I don’t understand why PhD students are not qualified to review papers. It is even possible that if you send the paper to the professor, it will end up on the PhD student’s desk. I know several professors who do that. So, why not sending the paper directly to the PhD student so that S/he can at least get some credit for that. And about blacklisting authors who publish in bogus journals, I don’t think it is logical to ban people only based on this issue. I don’t approve of bogus journals, but this does not seem to be the best response. I am talking about High Quality Publications in High Quality journals. In order to maintain the quality, papers should be reviewed by experts, a PhD student is only a beginner, not an expert. This is not the matter of giving CREDIT to anybody, but a matter of CREDIBLE publications. If a researcher publish in bogus journals, it simply means he/she is not a credible researcher and such researchers MUST be banned from publishing in credible journals. If people are aware of this, then they will be more careful and will not do this. Stringent measures should be taken to maintain the quality of research worldwide. Now a days huge number of fake and bogus research articles are published worldwide. Genuine scientists and researchers will not oppose any strict measures taken by the publishers and scientific community. I am not certain if I can be called a “genuine” scientist or not, but after working in the academic world for over 10 years, I believe a well-educated PhD student who has also published in high quality journals is completely qualified to review papers in his/her own field. Often times contribution of supervisors and advisers to a paper is minimal and the chunk of the work has been done by the student. I can even argue that some authors in the list (including the supervisor) have minimal knowledge of the contents of the paper (unfortunately!!). About publishing in bogus journals, I still believe handling submissions should only be based on the quality of the work submitted. I don’t support any background search by reviewers and I also believe peer review process should be double blind to avoid any potential discrimination. A scientist cannot be banned forever for publishing one paper in a predatory journal. There is another side of this issue of authors suggesting reviewers. If the paper challenges orthodoxy in the field, it is hard to get an unbiased review of the paper, no matter how good it is. Speaking with the editor about this and letting the author suggest at least one of the reviewers is not such a bad thing. Editors, I have found, are often very squeamish about making their own assessments of the quality of a paper or going against even the most obviously biased reviews full of ad hominem attacks on an author, especially if the review is by someone well known in the field. So what is the impact on cancer patients and chemotherapies and immunotherapies? Many legit writers are/were actually naive enough and tricked by those journals, especially back then when the term has yet to make waves. It`s definitely unfair to write off them due to one unintentional mistake. “Peers” who are not experts in a specific area of research should not review. “Reviewers” should not be vindictive just because authors have not referenced their work. “Reviewers” who are in competition with authors have a conflict of interest. If “Reviewers” have nothing positive to contribute, try not to say negative things — it may not suit your taste, but it does not mean the paper is no good.